Hormone-free, Dry-aged Angus beef and other specialty meats locally processed at USDA inspected lockers. All orders shipped to your door. Check out our prices for Beef and Steak! Beef and Steak is an essential part of a healthy diet, suppling protein and needed minerals to the human body. Especially if they are lean red meat, which all Wiegand steaks are. 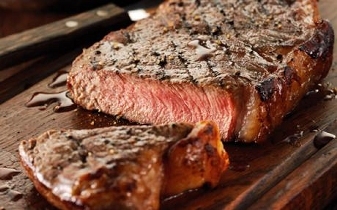 Did you know that a four ounce steak supplies almost half the protein needed for an average adult? You need protein to build and repair muscle mass. And what better way that from tender, juicy and tasty Wiegand Steaks? Zinc is another mineral that aids the body in many ways, ranging from skin care to prostate health. Another amazing benefit of zinc is that it strengthens your immune system. The average adult needs about 11mg of zinc a day. Beef supplies about 5 to 7mg per serving, depending upon how it is cooked and the cut of meat. Lean red meat (beef and steak) also supplies several necessary B vitamins. B-12 helps your body maintain a healthy nervous system, B6 to strengthen your bodies immune system. Bottom line is; lean red meat should be a part of a healthy diet. At Wiegand Steaks Rump, round, and sirloin tip steaks are 90% lean while the rest of our products; various other steaks, beef sticks, gourmet beef patties and organically seasoned spicy jerky are 87% lean. Allowing you to eat well without sacrificing taste. Bulk Ground Steak 87% lean $8.00/lb. Skinless Beef Franks* $7.00/½ lb. New York Strip Steaks $18.00/lb. “Prayer is not asking. It is a longing of the soul. It is daily admission of one’s weakness. It is better in prayer to have a heart without words than words without a heart.